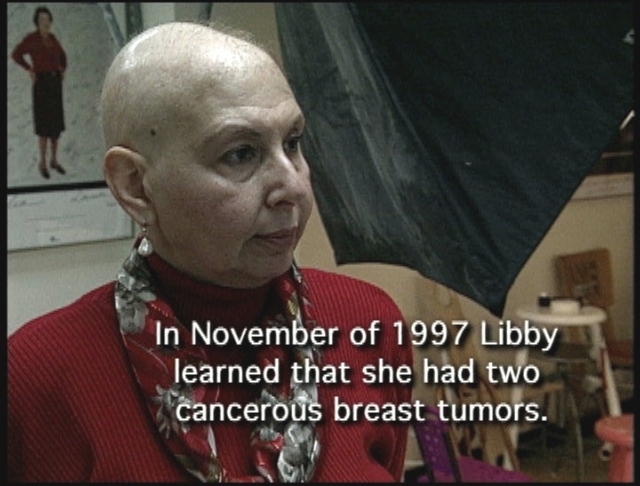 I'm Libby Levinson and on November 5, 1997, I got the good news that I had breast cancer. I had had a routine mammogram and some calcifications were discovered on the mammogram, on my left breast. My gynecologist recommended that I see a breast surgeon, who recommended a biopsy, and I got the results of the biopsy on November 5, that I had breast cancer. It was a very grave day. I was convinced that I didn't have breast cancer. I was reassuring the surgeon the day of the biopsy, not to worry about me, that I was fine, that my biopsy was going to be negative. I was trying to believe that, thinking that if I really, really held tight to that belief, that I wouldn't have breast cancer. The next step was to revisit the surgeon and to discuss with him what my options were, whether to have a lumpectomy or a mastectomy, whether to have reconstruction with a mastectomy, whether to have bilateral mastectomy or just the mastectomy on the left side. I opted for the mastectomy and not the lumpectomy because there were actually two sites in the breast, two locations where they found calcifications. Only one location had been biopsied, and of course it was positive for cancer. So I was convinced that the other location would also be cancer, and I just opted to have the breast removed rather than going and having another biopsy and having to wait another couple of days to find out whether in fact it was cancer. I couldn't live with that. I just wanted the breast off. I made up my mind right then and there in the surgeon's office. My husband was with me; my sister was with me. They were both very supportive of my decision, and I was anxious to move forward with my surgery. The surgeon insisted that I visit a plastic surgeon to learn about reconstructive surgery and then to make my decision as to whether I wanted it. I knew I didn't want reconstructive surgery. I just wanted to have the breast removed. I met Debbie Dorsey at a breast cancer support group. It was exactly a week before I was scheduled to start chemotherapy. I came into the group very frightened, not knowing what to expect, not knowing what the women were going to look like, how they were going to feel. I came, sat down, and burst into tears. I introduced myself once I got my composure. I learned that there was one other woman in the group who was exactly a week before her first chemotherapy treatment and had all the same fears and concerns that I had, and that was Debbie. Debbie and I bonded at that point. I remember she called me that night and we talked about the group. We talked about how much better we felt after having been with the group and being with the women who were having the same treatment that we were going to have and seeing that they were actually okay. Some of them were even still working. Our treatments were pretty much simultaneous. We finished on exactly the same day, February 19th. Actually Debbie's first treatment was a few days before mine. She called me as soon as she got home, and she said to me, Libby, it's doable. So Debbie was somebody to joke with, even though the humor was kind of sick. We had our own little vocabulary of chemo words that we used, chemo breast and chemo mouth and chemo farts, and we talked about all the reasons why it was good not to have hair and how much money we were saving on shampoos and haircuts and how easy it was in the morning to get ready. 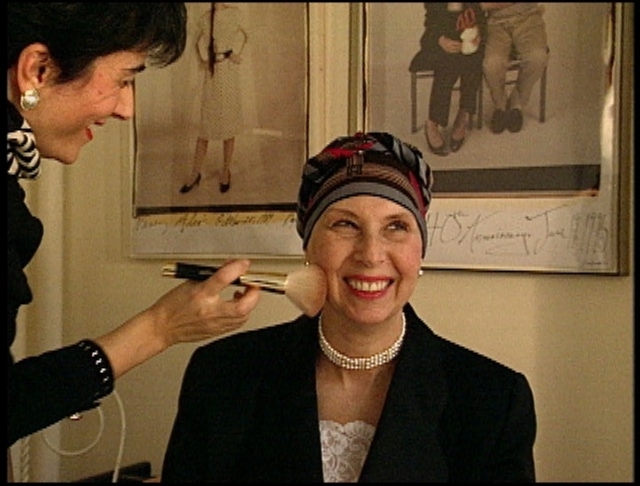 We did a lot of laughing together, something that I couldn't do with most anybody else because most everybody else was pretty much horrified about the cancer and the treatments, but with Debbie I just let my hair down and we just made humor in what we were going through. We let our hair down. Then through Debbie I met Carol. Carol was in the hospital with neutropenia, which is often a result of chemotherapy. I was admitted to the hospital because I had neutropenia. Debbie of course knew that Carol was in the hospital and called her on the phone and said, Libby's being admitted. I had never met Carol and I was in my hospital room, scared to death of what was happening to me, thinking that I was probably going to die because I had no white cells to fight off this infection that I had. There was a knock at the door, and a person came in with no hair, a bald person and a mask, and this is how I met Carol. She'd left the floor that she was on and she took the elevator and came down and found my room and came in to introduce herself. She immediately assuaged all of my fears and told me about what it was like and how she felt, and she was actually leaving the hospital that same night and going to Hawaii the next day. I thought, I guess I'm going to be okay after all. Debbie was the one who connected us with Elsa. 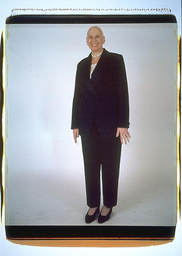 Debbie called us and said, How do you feel about having your portrait done? A photo portrait with no hair. Bald. And I thought, Yeah, that sounds pretty good. It was very difficult. I was very self-conscious of having no hair. I did not enjoy having no hair. I wore my wig faithfully every day to work. I was never seen in public without my wig. 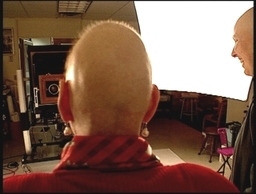 The only time I didn't wear my wig was when I went to chemotherapy, because why should I wear my wig to chemotherapy? When Deb first asked me if I'd be interested in having a photograph taken of myself or having photographs taken without my hair, a portrait of a bald woman going through chemotherapy, my first reaction was, yeah, I guess so, why not? And the more I thought about it, the more I thought it would be symbolic for me because no one outside of my immediate family ever saw me without my wig or a hat. My head was always covered. My friends at work, the people that I would see on the street all looked at me like I was just, you know, another person. 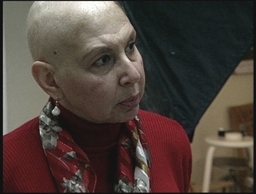 But the real me, the real person was a bald woman who had lost her hair because of chemotherapy. And I thought, yeah, I want to do this. I want the world to see how I am. It may not be socially acceptable for me to take my wig off at work, but this is the real me. And so I agreed to do it. The three of us cooked up chemo-chic. Chemo-chic was going to chemotherapy looking chic. What we did was, we would buy beautiful scarves and tie them around our heads and then don a cap, a baseball cap or a hat, or something over the scarf, and look really cool and have an attitude. It was the chemo-chic attitude. 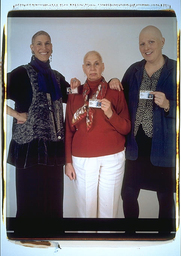 And this is how I went for my chemotherapy every time and we laughed, the three of us, about chemo-chic. I kind of felt that, well, through photography, through the photographs, we were being immortalized. And if we were lucky and we made it, fine, we had the moment captured on a photograph. And if we didn't make it, if we weren't lucky, there we were, captured in Elsa's photographs. I try to encourage women who are newly diagnosed with cancer to join a support group and be with other women who are going through exactly what they're going through. Because there is nobody else who understands what it's like, how you feel, what your fears are. There's nobody else who understands why the first thing you think of when you wake up in the morning is, am I going to die? Am I going to be okay? And the last thing you think about before you go to sleep, am I going to die, am I going to be okay ? Libby Each time I went to the hospital for my treatment or if it was for a doctor's appointment, I would identify myself as my Beth Israel Hospital number or my Social Security number. They're not interested in your name. They want to know your number so that they make sure that they give the medication to the right number. I was very solemn in this picture because I felt that I wasn't a person. I was a number being treated for breast cancer. A statistic. Elsa Libby really wanted me take a picture of her holding a card with a number. She even brought cardboard and magic markers to my studio, along with an ugly hospital johnny, so she could draw a big number. She wanted to hold her number right across her chest. Number: I could only think of a prisoner's number or a concentration camp person's tattooed number. I couldn't get past it. Luckily the hospital identity card was nothing to look at. Carol emptied all her charge cards. There was her drivers license. How about using that? Libby pulled out her license and so did Debbie. They looked at the pictures of themselves BEFORE the cancer. They really did look different. Libby We held up our driver's licenses, which is kind of odd because on our driver's licenses we all have hair. 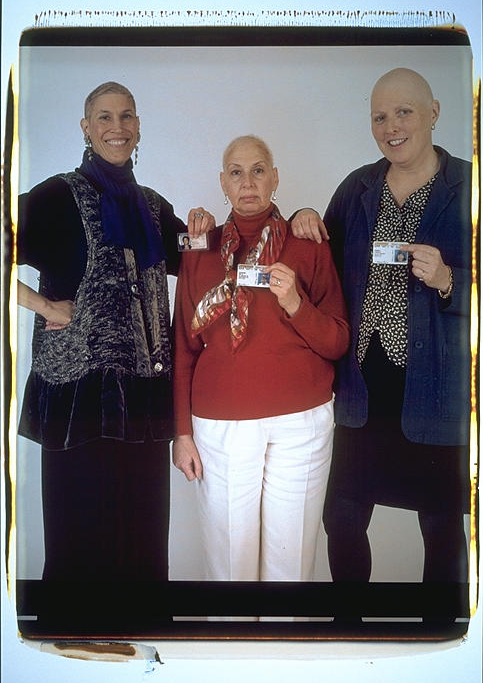 In the portrait we're all women with no hair and we are holding up photos of ourselves with hair. But the driver's license is an identity card.